Despite having been to the Science Museum in London as a family at least twice in the last year, during our visit on Good Friday we somehow found ourselves in an exhibit that we'd never seen before and learning something new about aviation. 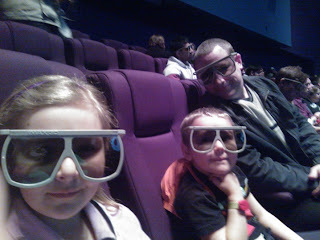 We'd been invited down by the Science Museum, (who had offered us Explorer Tickets for our visit so that we could experience a film in the IMAX cinema, a ride in Legend of Apollo in the Force Field 4D theatre and a ride in the Red Arrows 3D exhibit) and as we had already planned for a family visit during the Easter break we were excited to visit these attractions. We started our visit to the Science Museum as we always tend to start days out, with a trip to a Cafe. We love the Energy Cafe for the great selection of foods they have and despite it always being busy we were able to find a table and plan where we wanted to visit on this trip. We headed off into the Museum, we all have our favourite parts and we had decided that we wanted to visit them, but first of all we were going to visit one of the exhibitions that we hadn't visited before and one that we thought both Big Boy and Top Ender would enjoy, so we headed up to the Challenge of Materials. I'd told the Children that they had to pay lots of attention as they were going to be given Mummy home work based on what we learnt in the exhibition. They took this to heart as the children questioned what we were reading to them and asked for further information when they didn't think that we'd answered all of the questions they had, I'll post a picture of their home work on Facebook in the next couple of days. I had wanted to head over to the Bionic Man, as I thought that Big Boy would find the artificial pancreas interesting (seeing as his is dead and just floating in his body!) but instead we headed on to the 3D imax showing about the Hubble Telescope. The video was long but worth it and the closest that I'm ever going to get to a shuttle launch. Big Boy did get a bit fidgety during the video, so I don't think that children under the age of 4 would enjoy the film, even though Big Boy did in the end love having seen the stars as God sees them. Top Ender was really upset when we decided it was time to leave. Tops had wanted to stay and see a few more exhibits, but after agreeing that we'd come back in a couple of months time to see some more, and again a couple of months after that and that and that she was soon appeased. I guess that's what we love the most about the Science Museum. Yes, it is a Museum (which can sometimes be boring) but it's one that Children and Adults love and has the added benefit of teaching Children and Adults so many new things. If you have the time during the School Easter Holidays to take your family down to the Science Museum, or at any time really, then take the opportunity and make sure that you pay as much attention as the Children so you can learn something too. We were given Explorer Tickets and spent a very enjoyable day in the Museum.